Gudmar was initially known as meshashringi in Sanskrit, which means “ram’s horn”. The plant can be described as a large, pubescent, woody climber. Its leaves are elliptic, opposite or ovate. The small flowers are yellow and in umbellate cymes. The follicles are terete, lanceolate and up to 3 inches in length. 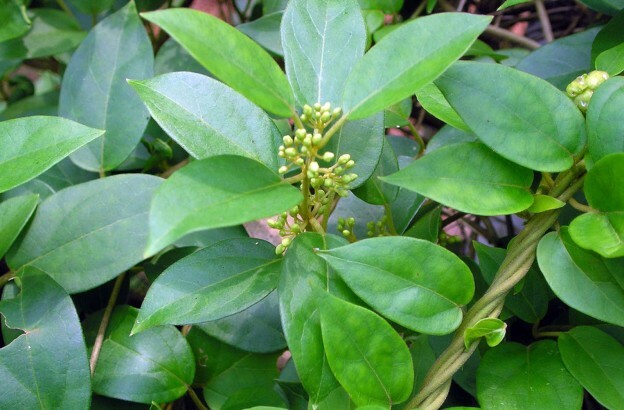 The plant is native to the tropical forests of southern and central India. It is known as gurmar and merasingi in Hindi and meshashringi, vishani and madhunashini in Sanskrit. The medicinally active parts of the plant are the leaves and the roots. It came to be known as “destroyer of sugar” in ancient times. (+)- gymnema saponins I-IV, gymnemic acids I-IX, acylated (tigloyl, methylbutroyl, etc) derivatives of deacylgymnemic acid (DAGA), 3-O-glucuronide of gymnemagenin (3, 16, 21, 22, 23, 28-hexahydroxy-olean-12-ene), gymnemosides A-F, triterpene saponins, dammarene saponins, flavones, anthraquinones, hentri-acontane, pentatriacontane, a and ß- chlorophylls, phytin, resins, d-quercitol, tartaric acid, formic acid, butyric acid, lupeol, ß-amyrin related glycosides and stigmasterol. It forms one of the ingredients in the manufacture of all natural medication for diabetes, apart from cinnamon, chromium, zinc, biotin, banaba, huckleberry and bitter melon. Extracts of the herb are believed to treat problems like hyperglycemia, obesity, high cholesterol levels, anemia and digestion. Gudmar suppresses the taste of sweet foods and consequently reduces the desire to eat. Its root is made into a paste or powder and applied to the wounds of snakebites. Gudmar is useful in hepatosplenomegaly, dyspepsia, constipation, jaundice, halminthiasis, cardiopathy and amenorrhoea. Chewing fresh leaves of gudmar paralyzes the taste for sweet and bitter substance for some time.